Sweet potato contains over twice the amount of vitamin A you need for the day (source: Whole Foods). Trust me, it’s easy to eat more than one sweet potato worth of these fries! 1 Place the sweet Potato into a large pot and cover with Water. 2 Bring to a bOil over high heat, then reduce heat to medium-low, cover, and simmer unTil tender, about 20 minutes. 3 Drain and allow to steam dry for a minute or two. 4 Allow to cool, then slice each sweet Potato into wedges. 5 Arrange wedges on a baking sheet. 6 Preheat an oven to 400 degrees F (200 degrees C). 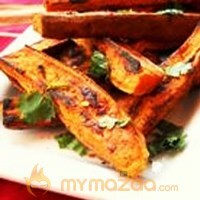 7 Brush the sweet Potato wedges with Olive Oil, and lightly season with Salt and Pepper. 8 Combine Sea Salt, lime zest, Chili powder, Paprika, and Red Pepper Flakes in a small bowl. 9 Bake in the preheated oven unTil golden brown on all sides, about 20 minutes. 10 Plate and sprinkle with the seasoning mixture and Cilantro immediately.